The outgoing Audi A3 was introduced almost ten years ago and while it's been facelifted and improved over that time, it's certainly been due a replacement. What's surprising is that Audi has left it this long. With the recently revised BMW 1 Series - the main rival to the A3 - becoming so popular, the A3 has been somewhat left behind. So there are big expectations for the new A3. Audi hasn't broken the mould with the styling though. It's a case of sticking to what you know with the familar Audi look that focusses on clean lines and an unfussy appearance. It works very well on the A3 with a front end similar to the A4 including those angular lights. It looks good from the back too, the wider rear lights blending into the squared off tailgate. This is of course the three-door but the five-door Sportback will be launched in Spring 2013. No doubt the A3 will have its critics who say it's dull. True it's not the most daring of designs but the inside is more of a surprise. Rather than just going for a copycat interior of the A1 or the Q3 as you might expect, the A3 gets its own interior that's different from any other Audi. It looks great with some nice design details like the circular vents (similiar to the previous A3), a new layout for the MMI system with slimmer switches and my favourite, a strip that runs across the dash and includes a line of buttons just above the air conditioning controls. According to Audi, the designer of the interior was charged with essentially creating an interior similar to the luxury A8 but scaled down to fit in the A3. It has a similar upmarket feel to it and feels a cut above others, with more finesse and style than the interior of the BMW 1 Series. Small luxuries like having an electric parking brake rather than a conventional handbrake add to overall feeling of quality. This also means there's no handbrake to bash against the centre armrest as in the old A3. 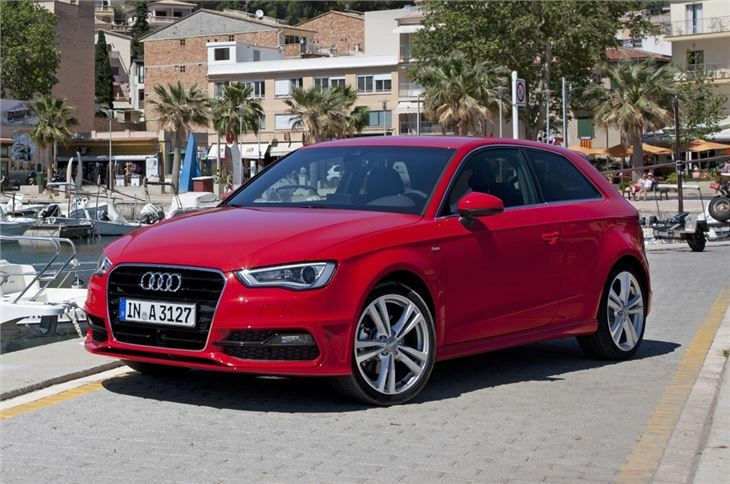 But the big difference between this A3 and the old model is the ride and handling. Thanks to new suspension and a stiffer body, it's much improved. There's better grip, better steering and a more compliant ride, even on the Sport and S line models which get sports suspension, a lower ride height (15mm lower on Sport and 25mm lower on S line) plus bigger alloys. Of course if you don't want the sports suspension, you can have the standard suspension fitted as a no cost option. All this combines to make the A3 feel like a bigger car all round and it corners incredibly well with great body control and a nice weight to the steering. Like the the A1, the A3 is a very enjoyable and easy car to drive, while still remaining comfortable. There is also the optional Audi drive select system that lets the driver vary the characteristics of key components, such as the steering weight, throttle response and the transmission shift points (where S tronic is fitted). From the launch there are just three engines, although more will be added soon after. To begin with the choice is down to two TFSI petrols - a 1.4 and a 1.8 along with a new version of the 2.0 TDI which has 150PS. At the end of 2012 the frugal 1.6 TDI will be launched and in Spring 2013 a 1.4 TFSI with 140PS arrives. The 2.0 TDI is likely to be the most popular model but if you aren't doing big miles then the petrols make more sense, especially the 1.4 TFSI. In SE trim this is the cheapest version of the A3 at £19,205 but it doesn't feel at all like an 'entry-level' engine. With 122PS it may seem underpowered on paper but we've been impressed with this engine in other cars before and it's just as good in the A3. Thanks to the turbocharger it has plenty of low down pulling power so you don't have to work the engine hard to make swift progress. If you are feeling a bit more eager, the TFSI unit is happy to be revved up to its maximum and it continues to impress with plenty of power at the top end too. It sounds good with a nice sporty note. On paper it does 0-62mph in 9.3 seconds but feels quicker in everyday driving and more importantly, it's really enjoyable to drive. It's that good it almost makes the 1.8 TFSI redundant. The 1.4 TFSI feels as fast and you only really notice the difference right at the top of the rev range where the larger engine has more in reserve. The 1.4 TFSI is economical too with a claimed average of 54.3mpg while emissions of 120g/km put it in VED band C, currently just £30 a year. The key with the new A3 is not to be fooled by the familiar looks. Inside it's a very different car from before and that's true underneath the skin too. It's a big leap forward in quality, refinement and driver appeal. And that's from what was already a very competent car in the shape of the previous A3. It's definitely a car that needs to be driven to be truly appreciated. 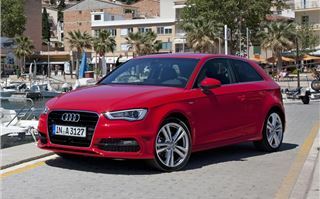 The new A3 is available to order now and the first cars will arrive in September.